STILLEN and AP Racing are proud to announce the release of upgraded Curved Vane Front and Rear Brake Rotors for the R35 Nissan GT-R. 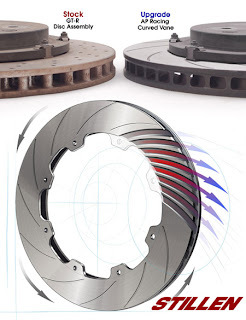 These AP Racing Rotors are a track-proven upgrade to the OE Brembo components. 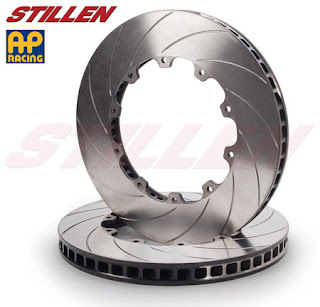 The STILLEN / AP Racing Curved Vane Rotors utilize a curved-vane core (48 vanes) which allow for better thermal management, providing improved cooling over the OE pillar vane design. They also have 12 curved slots which improve pad bite and not prone to cracking under severe use, which the OE rotors are plagued by. The need for these rotors became evident quickly when GT-R owners in the UK began touring various race tracks, and having issues with standard discs only lasting 2-3 track days at the maximum. AP Racing was contacted, and within a couple of weeks rotors were available and testing began. Results were all positive, with no signs of cracking, and consistency of pedal and performance were reported. * Top quality, proprietary iron alloy with multi-stage thermal processing. * Curved-vane core (48 vanes) for better thermal management under extreme use. More expensive to make, but improved cooling over the OE pillar vane design. * 12 curved slots (not drilled!) to improve pad bite and resist cracking under severe use. * Precisely balanced at high RPM for smooth operation at any vehicle speed. * Friction faces finished on the latest generation twin-turning equipment, better DTV (Disc Thickness Variation) and less runout than typical double-disc grinding machines. * Includes fresh hardware for track-day confidence every day. * Added bonus: Even priced less than the standard OE discs!